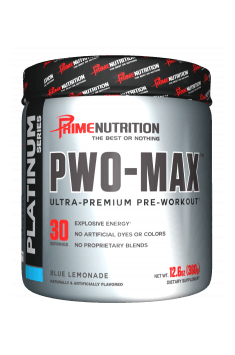 Prime Nutrition PWO-MAX is an advanced pre-workout supplement designed for the most advanced users. It contains the strongest active substances which maximise physical performance. At first it should be emphasised that the supplement is not designed for begginers or intermediate athletes. It will be too strong for them and may cause side effects, including annoyance which makes it impossible to focus on training and decreases physical capacity. Beta-alanine – an amino acid which is a precursor of carnosine on which it relies its main mechanism of action in the body. Carnosine may act as an acid-base buffer. In terms of physical performance, it helps prolong maximum efficiency of skeletal muscles by neutralising the action of lactic acid. Balancing the pH in the myocytes does not only help promote exercise capacity but also has a beneficial effect on regenerative processes by creating an optimal environment for these cells. Agmatine sulphate – a compound which has a significant impact on the metabolism of nitrogen oxide (NO) in the body. By activating α2A receptor, it promotes NO synthesis. It shows thus much higher efficacy than arginine used also for this purpose. An increase in nitrogen oxide levels in the body may have a beneficial effect on cardiovascular function by increasing the lumen of blood vessels. It is associated with increased transport of blood to peripheral tissues and thus energy substances. As a result, muscles are nourished better and may therefore function more efficiently. Taking agmatine before a workout may also be effective due to its neuromodulatory abilities. The supplementation with this compound may reduce states of anxiety, relieve symptoms of depression and also have an analgesic effect. Sodium nitrate – a compound which supports physical performance in two ways. Firstly, it provides nitrate which is supplemented to promote nitrogen oxide synthesis. The addition of sodium nitrate increases the product’s ability to boost arteriovenous blood flow. It helps get a feeling known commonly as muscle pump. In addition, sodium nitrate provides also sodium ions which are a vital electrolyte. During physical activity, the human body loses minerals through sweat. Making up their deficiencies contributes to maintaining optimal water-electrolyte balance in the body which is necessary for preserving a physiological environment for metabolic reactions. N-acetyl-tyrosine – a highly absorbed form of tyrosine which shows comprehensive stimulating properties as a precursor of many hormones and neurotransmitters. By taking part in the pathway synthesis of adrenaline and noradrenaline, tyrosine may promote their secretion which may have a stimulating effect on functions of the whole body. These hormones get body into the state of alertness which promotes metabolic processes for increasing physical performance. Tyrosine is also a precursor of dopamine, a catecholamine which functions as a neurotransmitter. In the case of emotional functions, it is responsible for stimulating the motivation centre and may also increase cognitive functions. In relation to functioning of the motor system, dopamine is accountable for neuromotor coordination. What is more, this amino acid is a precursor of thyroxine and triiodothyronine, hormones secreted by the thyroid. Their main role is to stimulate metabolic processes. Choline bitartrate – a source of choline, a compound which is the precursor for acetylcholine, an extremely important excitatory neurotransmitter. Providing substrates for Ach production may promote their synthesis which results in improving neurotransmission. Choline is also vital to energy metabolism of the body. It is involved in the methylation process in which it serves as a donor of methyl groups. As a result, choline supplementation may increase the efficiency of energy production from nutrients by the body. DMAE – dimethylaminoethanol, shows a mechanism of action similar to choline (it is also a precursor of acetylcholine), although it is more effective due to a greater ability to cross the blood-brain barrier. DMAE is used mainly to improve cognitive functions, memory and concentration. It demonstrates also the ability to speed up reaction time. In addition, dimethylaminoethanol has been shown to have a beneficial effect on emotional states. Caffeine – for better efficacy, the supplement contains two forms of caffeine: citrate and anhydrous. It is the most commonly used stimulant. It has been used for ages to promote physical and mental capacity in the form of coffee and different kinds of tea. It owes its effectiveness due to unique mechanisms of action. It is a competitive inhibitor of adenosine, a factor which informs the body about fatigue. It binds to its receptors by restricting the access to them for adenosine, consequently blocking fatigue signals in the body. Furthermore, caffeine is also a competitive inhibitor of cAMP-phosphodiesterase which converts cyclic adenosine monophosphate into its inactive non-cyclic form. As a result, caffeine boosts cAMP levels in the cell and thus promotes its metabolism. What is more, it enhances therefore the effectiveness of adrenaline in the body. 1,3-Dimethylamylamine – also called DMAA or geranium, is a stimulant with impressive potency (it is so effective that it was banned by WADA). It is an inhibitor of noradrenaline reuptake and thus promotes its stimulating effect in the body. It reduces fatigue, adds energy, promotes strength and physical endurance. It has also a positive impact on mental functions and increases mental clarity. DMAA supplementation may also promote well-being. To sum up, Prime Nutrition PWO-MAX is a strong agent which maximises your exercise capacity. It is designed for advanced athletes, insensitive to the action of standard pre-workouts. The supplement promotes comprehensively physical performance and increases the effectiveness of thought processes. It helps cross next training barriers and use the maximum potential of your body in the gym. Citric acid, natural and artificial flavors, sucralose, stevia, malic acid, salt, acesulfame-potassium, maltodextrin, silicon dioxide, calcium silicate.